THE NATIONAL WOMEN’S Council of Ireland has published a report on how to build a “women-friendly” Oireachtas. The research for this report was conducted as part of NWCI’s ‘Women in Politics and Decision-Making’ project and the primary research for the report was conducted by Eóin Murray. The report recommends six ways to make the Oireachtas more open for women. Making the day-to-day business in the Oireachtas more “family-friendly” by introducing maternity leave for female politicians and also introducing paternity leave for men. The report found that working late hours and having late night debates hindered women specifically and called for more work to be done within business hours. They also recommended introducing video-conferencing. Other reccommendations include applying a 40 per cent gender quota for Cabinet appointments, conducting a gender audit in the Oireacthas so as to “establish a clear plan” and also developing a “code of conduct” centered around the “acceptable and respectful” behaviour in the Oireachtas. It was also suggested that TDs should be given gender-sensitivity training so that they understand why and how to introduce equality and gender analysis in to their daily work, said the report. It was also suggested that all political groupings should designate a small amount of their funding to the establishment of a women’s caucus with an independent secretariat. The report finds that there is a “masculine culture” in government, due to a number of factors such as, there being no work-life balance, business often being done outside the Dáil chamber, “on weekday nights in the pub,” it states. Many of the people featured in the report asked to remain anonymous. These individuals included both public representatives and researchers from Fianna Fáil, Fine Gael, Labour and Sinn Féin; staff from the Houses of the Oireachtas and a number of academic researchers. … I remember actually coming back off maternity leave and bumping into a politician, who said to me “where have you been?” Because obviously I had been out of circulation for a couple of months, and I said “I had the baby”, “Oh right, yeah, yeah”; “I took maternity leave”. And I always remember him saying “politicians don’t take maternity leave”. And I said “I tell you what, this politician does, and did, and now I’m back”. When kids are brought here we bring them to the bar, we give them a soft drink but it is still the bar. We don’t have a visitor centre. That is one of the things I would change, there ought to be a room were kids, visitors groups have a room where they can sit comfortably and be given a soft drink. The combination of the time away from family and the need to conduct a lot of work through socialising around the environs of Leinster House can also be problematic. This can put a significant amount of pressure on members, especially those from rural areas who can be away from their homes and constituencies for extended periods of time. The report also cites incidents of “sexist behaviour” in the Dáil, citing Tom Barry grabbing Áine Collins during a a late-night debate on abortion and when Taoiseach Brian Cowen ordered Labour Party Leader Eamon Gilmore to “rein in” his deputy Joan Burton. Email “There are 6 ways to make the Oireachtas more women friendly, says NWCI”. 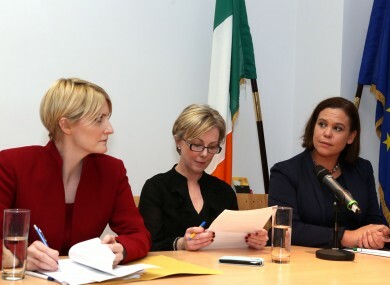 Feedback on “There are 6 ways to make the Oireachtas more women friendly, says NWCI”.